Compared to other countries in the world, Israel is a very small parcel of land located in the Middle East--but three major religions (Judaism, Christianity, Islam) lay claim to it. What do the "scriptures" have to say about "Israel"? What a wonderful promise! God tells Abraham that He will make him a great nation, and that he would be a blessing to the world. From Israel and the Jewish people, we have received the Bible, the Messiah Yeshua Himself, and even the church was birthed out of Israel. But God doesn't stop there. He also said He would bless those who bless this small nation of Israel, and curse those who curse Israel. Did you catch that? ...an everlasting covenant ...for an everlasting possession. It can't be any plainer, yet many in the church believe in Replacement Theology. Replacement Theology teaches that Israel (the Jewish people and the land) have been replaced by the church. It says Jewish people are no longer God's chosen people. It says they are no different than any other group, such as the English, Spanish or Africans. They claim that since the Pentecost of Acts 2, the term "Israel" now refers to the Church. The promises, covenants and blessing ascribed to Israel in the Bible have been taken away from the Jews and given to the Church. This might have seemed true 100 years ago, especially since there was no nation of Israel. But in 1948 something happened. Israel was born again from the ashes of the Holocaust of World War II. 12 Therefore prophesy and say unto them, Thus saith the Lord God; Behold, O my people, I will open your graves and cause you to come up out of your graves, and bring you into the land of Israel. 14And (I) shall put my spirit in your, and ye shall live, and I shall place you in your own land: then shall ye know that I the LORD have spoken it, and performed it, saith the LORD. Isn't that exactly what God did after World War II? The spirit of God came upon the dry bones of a nation that no longer existed, that had been dead for 2000 years, and suddenly Jews from all over the world had a homeland, in the very same place that God had given it to Abraham. Coincidence? No, just all part of God's timetable. 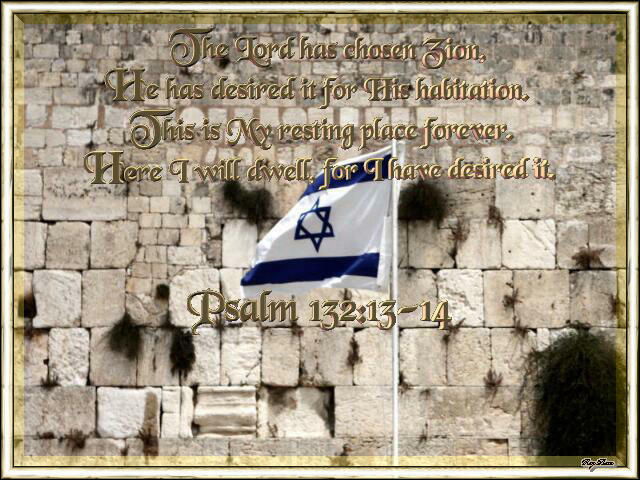 Israel is the only nation that has ever passed away, and then been reborn. The church has not replaced Israel, but rather has been called along side of her. We've been called to love her, bless her, pray for her, and stand with her. 1 I say then, Hath God cast away his people? God forbid. For I (Paul) also am an Israelite, of the seed of Abraham, of the tribe of Benjamin. 2 God hath not cast away his people which he foreknew. That should be easy enough for all to understand, but sadly enough, some in the church don't seem to see it. One of our responsibilities as believers is to shed light on this truth. 11 I say then, Have they stumbled that they should fall? God forbid: but rather through their fall, salvation is come unto the Gentiles, for to provoke them to jealousy. Because of their fall, Salvation is come to the Gentiles. And now, scripture says we will provoke them to jealousy. That would not likely happen to the church of the past. There has been so much anti-Semitism and hatred for the Jews in the church, what could there be that would cause them to be jealous? Even the Holocaust of WWII occurred in "Christian" Europe. Only recently have true believers started embracing their Jewish brothers and recognizing that God has not finished with them. 23 ...For God is able to graff them in again. 1. We (a wild olive tree) have been graffed in. 2. The root supports the branches, not the other way around. 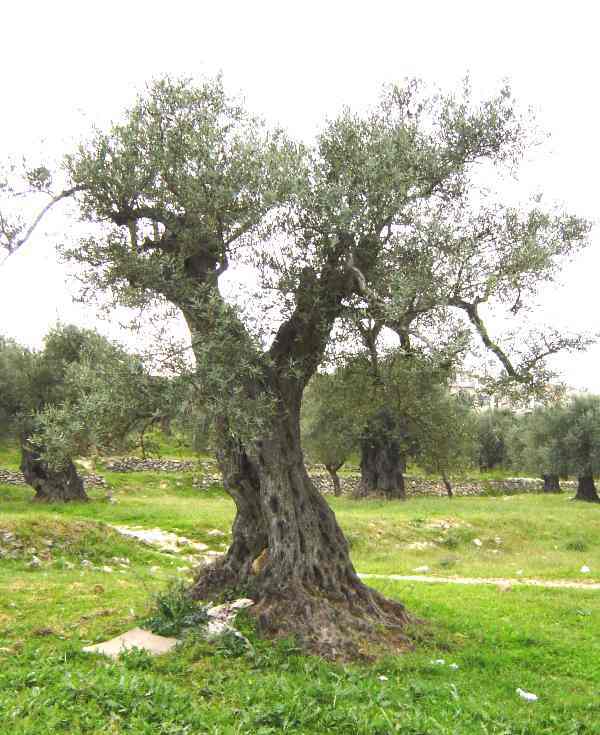 Israel and the Church, natural olive tree and wild olive tree graffed together, need each other. Israel (the root) without the branches (the church) bears no fruit. The church (the branches) without Israel (the root) does not receive the nourishment it so desperately needs, and will eventually die. 6 ...I am the way, the truth, and the life: no man cometh unto the Father, but by me. And since Romans 11 says all Israel shall be saved, we know that it will come to pass. When God makes a promise, He is capable of fulfilling it. Often we've quoted this scripture concerning a particular calling we think we have. How can we do that and totally ignore God's gifts, calling and covenant with Israel? 20 And as for Ishmael, I have heard thee: Behold, I have blessed him, and will make him fruitful, and will multiply him exceedingly; twelve princes shall he beget and I will make him a great nation. BUT, God's covenant is with Abraham's son Isaac. 18 In the same day the LORD made a covenant with Abram, saying, Unto thy seed have I given this land, from the river of Egypt unto the great river, the river Euphrates. Wow! This is certainly much larger than the current boundaries of Israel. Notice that scripture clearly states that the land given to Abraham was from the river of Egypt to the Euphrates River. We hear much in the news about Israel giving up land for peace...is that what God wants? 8 For thus saith the LORD of hosts; After the glory hath he sent me unto the nations which spoiled you: for he that toucheth you, toucheth the apple of His eye. Is there any question that Israel holds a special place in God's heart? 7 In this house, and in Jerusalem, which I have chosen out of all tribes of Israel, will I put my name for ever. If you were to see an aerial view of Jerusalem, you'd see the Hebrew letter Shin (which looks like a "W"), the letter for the name of God, "Shaddai". What is the Role of the Church concerning Israel? From "The Error of Replacement Theology" by Clarence Wagner, Jr.
We are called to show God's love to the Jewish people, for without them we would not have had God's Word or our Saviour who was a Jew from Israel. We are to show God's mercy. We are to give our material gifts to help them. 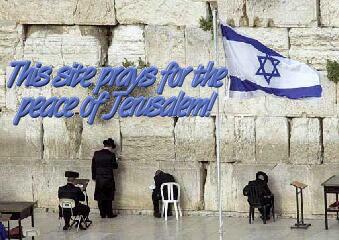 We are to pray for them and for Israel. We are to be watchmen on the walls to protect them. We are to help with their aliyah (immigration) to Israel and the building up of Zion. The following is a list of things to include when you pray for Israel. Jeremiah 30:17, "But I will restore you to health and heal your wounds," declares the Lord, "because you are called an outcast, Zion for whom no one cares." 2. Pray that God Would Raise Up Christian "Watchmen" to Pray for His Peace and His Purposes to Manifest in this Spiritually Strategic Land. 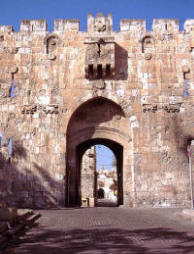 Isaiah 62:6, "I have set watchmen on your walls, O Jerusalem; They shall never hold their peace day or night." Deuteronomy 31:6, "Be strong and of good courage, do not fear nor be afraid of them; for the Lord your God, He is the One who goes with you. He will not leave you nor forsake you." 3. Pray for peace and Protection. Psalm 83:1-5, 18, "O God, do not keep silent; be not quiet, O God, be not still. See how Your enemies are astir, how Your foes rear their heads. With cunning they conspire against Your people; they plot against those You cherish. 'Come,' they say, 'let us destroy them as a nation, that the name of Israel be remembered no more.' With one mind they plot together; they form an alliance against You. Let them know that You, whose name is the LORD – that You alone are the Most High over all the earth." 4. Pray Against Radical Islam & Jihad. Jeremiah 15:20-21, "I will make you a wall to this people, a fortified wall of bronze; they will fight against you but will not overcome you, for I am with you to rescue and save you," declares the Lord. "I will save you from the hands of the wicked and redeem you from the grasp of the cruel." 5. Pray for Reconciliation – Jewish/Christian, Jewish/Arab and Other People Groups. Romans 11:18 "Do not boast against the branches. But if you do boast, remember that you do not support the root, but the root supports you." Psalm 133:1, "Behold how good and how pleasant it is for brethren to dwell together in unity!" 6. Pray for Healing from Pain in the Past. Psalm 126:1-3, "When the LORD brought back the captivity of Zion, we were like those who dream. Then our mouth was filled with laughter, and our tongue with singing. Then they said among the nations, 'The LORD has done great things for them.' The LORD has done great things for us, and we are glad. Bring back our captivity, O LORD, as the streams in the South. Those who sow in tears shall reap in joy. He who continually goes forth weeping, bearing seed for sowing, shall doubtless come again with rejoicing, bringing his sheaves with him." 7. Pray for Christian Arabs in Israel – Protection for Pro-Israel Ones, Release from Replacement Theology for Others and Help from the Church Rather Than Hamas. 8. Pray Against Terrorism in the Land. Psalm 91:4-6, "He will cover you with His feathers, and under His wings you will find refuge; His faithfulness will be your shield and rampart. You will not fear the terror of night, nor the arrow that flies by day, nor the pestilence that stalks in the darkness, nor the plague that destroys at midday." 9. Pray for Fair and Honest Media Coverage. Psalm 25:4-5, "Show me Your ways, O LORD, teach me Your paths; guide me in Your truth and teach me, for You are God, my Savior, and my hope is in You all day long." Amos 9:15, "I will plant Israel in their own land, never again to be uprooted from the land I have given them," says the Lord your God." 11. Pray for the Redemption of Israel. Isaiah 45:17a, "Israel will be saved by the Lord with an everlasting salvation." Ezekiel 36:26-28, "Moreover, I will give you a new heart and put a right spirit within you; and I will remove the heart of stone from your flesh and give you a heart of flesh. And I will put My Spirit within you and cause you to walk in My statutes and you will be careful to observe My ordinances. And you will live in the land that I gave to your forefathers; so you will be My people and I will be your God." Proverbs 3:5-7, "Trust in the LORD with all your heart and lean not on your own understanding; in all your ways acknowledge Him, and He will make your paths straight. Do not be wise in your own eyes; fear the LORD and shun evil." 13. Pray for Pro-Israel Initiatives and Leaders on College Campuses. Ephesians 1:17-19, "...that the God of our Lord Jesus Christ, the Father of glory, may give to you the spirit of wisdom and revelation in the knowledge of Him, the eyes of your understanding being enlightened; that you may know what is the hope of His calling, what are the riches of the glory of His inheritance in the saints, and what is the exceeding greatness of His power toward us who believe." 14. Pray for the Youth of Israel. Exodus 15:13, "In Your unfailing love You will lead the people You have redeemed. In Your strength You will guide them to Your holy dwelling." 15. Pray for the Coming of Messiah. Micah 5:2, "But you, Bethlehem Ephrathah, though you are little among the thousands of Judah, yet out of you shall come forth to Me the One to be Ruler in Israel, Whose goings forth are from of old, from everlasting." 16. Pray for Rain in the Land. Psalm 65:9, "You care for the land and water it; You enrich it abundantly. The streams of God are filled with water to provide the people with grain, for so You have ordained it." 17. Pray for Aliyah—for the Jewish Return to Their Homeland. Jeremiah 29:14 "I will be found by you," says the LORD, "and I will bring you back from your captivity; I will gather you from all the nations and from all the places where I have driven you," says the LORD, "and I will bring you to the place from which I cause you to be carried away captive." Jeremiah 16:14-16, "Therefore behold, the days are coming," says the LORD, "that it shall no more be said, 'The LORD lives who brought up the children of Israel from the land of Egypt,' but, 'The LORD lives who brought up the children of Israel from the land of the north and from all the lands where He had driven them.' For I will bring them back into their land which I gave to their fathers. Behold, I will send for many fishermen," says the LORD, "and they shall fish them; and afterward I will send for many hunters, and they shall hunt them from every mountain and every hill, and out of the holes of the rocks." 18. Pray for a Strong Alliance Between America and Israel. Ecclesiastes 4:9-12, "Two are better than one, because they have a good reward for their labor. For if they fall, one will lift up his companion. But woe to him who stands alone when he falls, for he has no one to help him up. Though one may be overpowered by another, two can withstand him, and a threefold cord is not quickly broken." 19. Pray for Caring of the Needy, Elderly and Homeless in Israel. Romans 15:27, "They were pleased to do it, and indeed they owe it to them. For if the Gentiles have shared in the Jews' spiritual blessings, they owe it to the Jews to share with them their material blessings." Isaiah 61:1-3, "The Spirit of the Lord GOD is upon Me, because the LORD has anointed Me to preach good tidings to the poor; He has sent Me to heal the brokenhearted, to proclaim liberty to the captives, and the opening of the prison to those who are bound; to proclaim the acceptable year of the LORD, and the day of vengeance of our God; to comfort all who mourn, to console those who mourn in Zion, to give them beauty for ashes, the oil of joy for mourning, the garment of praise for the spirit of heaviness; that they may be called trees of righteousness, the planting of the LORD, that He may be glorified." Psalm 82:3-4, "Defend the cause of the weak and fatherless; maintain the rights of the poor and oppressed. Rescue the weak and needy; deliver them from the hand of the wicked." Matthew 25:40, "I tell you the truth, whatever you did for one of the least of these brothers of Mine, you did for Me." The first Sunday in October is the international Day of Prayer for the Peace of Jerusalem each year.